A shorthanded Vancouver Whitecaps FC (15W-13L-5D) side fell 2-0 to FC Dallas (16W-10L-6D) on Wednesday in their penultimate regular season match at Toyota Stadium. It was an eventful night that saw both teams hit the woodwork within the opening 20 minutes, David Ousted save a Mauro Diaz penalty, and Marco Bustos make his MLS debut. In the end, a 32nd-minute goal from Michael Barrios and 52nd-minute tally from Diaz proved the difference. The result moves Dallas into a tie with New York Red Bulls for the top spot in MLS. 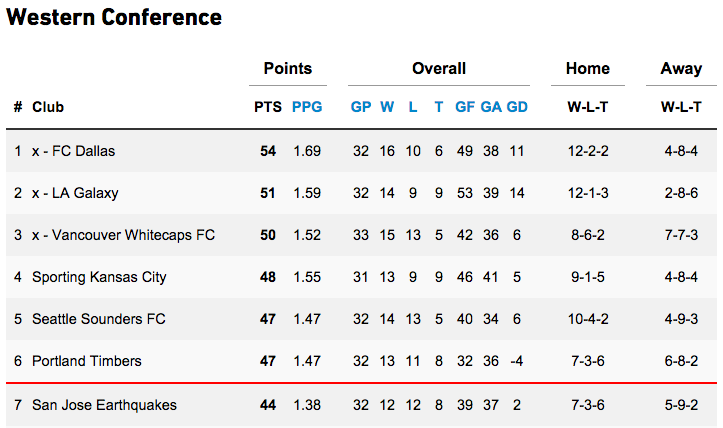 Vancouver, meanwhile, remain third in the Western Conference with one game to go. The odds were stacked against Whitecaps FC heading into this one. Carl Robinson was without the services of seven players due to international duty and injury, including the likes of Pedro Morales, Kendall Waston, Mauro Rosales, and Cristian Techera. The visiting ‘Caps held their own in the early going, but Dallas had the first real opportunity in the 11th minute. Against the run of play, a lively Barrios broke down the right and slipped an inviting pass into David Texeira, who hit the far post from the centre of the box. Shortly later, the ‘Caps hit the woodwork at the other end. Kekuta Manneh started the play with a low cross into Octavio Rivero, his strike partner on the night. Rivero then laid it off to Koffie, who hit the post with his first-time effort. Koffie was playing as an attacking midfielder behind Rivero and Manneh, as Robinson trotted out a 4-1-3-2 formation. And it nearly had the desired effect. Instead, Dallas took the lead in the 32nd minute through Barrios, who finished from close range after a nice build-up between Diaz and Ryan Hollingshead down the left. Dallas nearly added to their advantage 10 minutes later, when Tim Parker was whistled for a contested foul on Barrios in the box. But goalkeeper Ousted dove to his right to deny Diaz on the ensuing penalty – the Dane’s third PK save of the season. That was not the last we’d hear from Diaz on this night, however. In the 52nd minute, the Argentine playmaker beat a pair of ‘Caps before finishing from the top of the six-yard box to double Dallas’ lead. Whitecaps FC came on strong in the closing stages of the match – the injection of Bustos in the 61st minute seemed to spark Vancouver’s attack. They managed to create a few quality chances, but it just wasn’t their night in the end. Next up for Whitecaps FC is a CONCACAF Champions League fixture at CD Olimpia next Thursday. The ‘Caps will then return to BC Place to conclude the regular season next Sunday against Houston Dynamo (4 p.m. PT – tickets still available). Pa-Modou Kah was shown a yellow card in the 46th minute and will therefore miss next weekend’s regular season finale due to caution accumulation.